I promise hand on heart that this photo hasn’t been edited or messed about with in any way. We’ve been on holiday in North Devon all week and this was taken on Westward Ho! beach. The tide was just going out and the spring sunshine was dancing on the wet sand and creating a beautiful sky-sand mirror. This photo was taken with my Nokia Lumia phone and I think it’s rather beautiful and a little like a watercolour painting. The photo shows a silhouette of my husband as he approached an ancient shipwreck sticking out from the sand. We’d visited last year and had a good look at the wrecks and I was keen to see if they were still visible, which they are. You can read more about the history of the wrecks and see close up photos in this blog post from last year. Today is World Photography Day. I love photography and I want to get into it a bit more. This is probably one of my favourite photographs which I’ve taken. 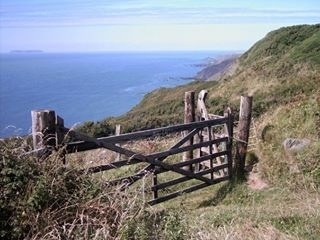 It is of the North Devon Coastline looking towards Hartland Quay. If you look carefully you can make out Lundy Island on the horizon. It’s such a peaceful spot. I love leaning against that gate and just contemplating life.